When you schedule Vacation Visits with us, you will be matched with one of our wonderful pet sitters, and will have an opportunity to meet her/him at a previsit consultation before you leave. There you'll have the opportunity to make sure your pet sitter will be a good match for your needs. The same pet sitter you meet is the one who will do all of your visits - we never send anyone in your home without giving you a chance to meet them! You will be able to discuss your pets' needs with your pet sitter, and communicate directly with her/him throughout your trip if you like. 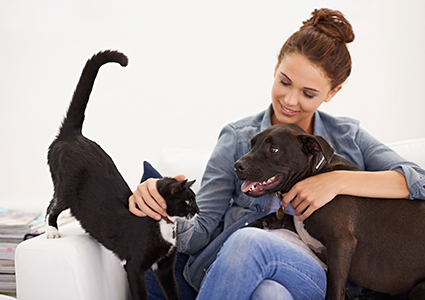 Each time your pet sitter visits, she/he will follow your precise instructions for your pets' care. Our online reservations system, Time to Pet, allows you to complete all of the information in your client portal. Your designated pet sitter and admin staff in the office will have access to view your profile, allowing everyone to view your information in real time. Time to Pet also provides a communications feature, allows you to view scheduled reservations, confirm visits as they are checked off as completed, and even view GPS tracking of your pet sitter's activity. Vacation Visits are fully customizable! We can visit dog households anywhere from two to five times per day, depending on your dogs' needs. Cats, birds, fish, and "pocket pets" generally require fewer visits, but we must visit at least once every 48 hours, and can visit as frequently as three times per day. View our pricing structure and Choose the package that's best for your situation!